Impasto is a technique used in painting where paint is laid on thickly to give a painting texture and an almost 3D effect. 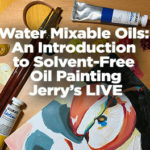 It can be accomplished with mediums such as acrylic, oil, or gouache. Early in painting, it was thought that the image being captured was more important than the medium it was painted with. Attention was drawn to the subject instead of the paint and canvas itself. The first notable artist to start painting with the Impasto technique was Rembrandt. In one of his self portraits from 1659. Thicker brush strokes are clearly visible across his face to give himself a weathered look. Claude Monet also used Impasto. He would add layer on layer of paint to add depth and give his paintings a “relief” effect to his paintings. 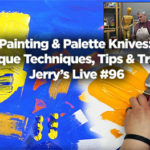 Impasto techniques became even more popular during the expressionist movement during the late 1800s where paint was quickly added to the canvas and the medium and thick brush strokes used more paint than needed. Vincent Van Gogh was notable for painting with thick brush strokes and instead of layering paint, he would even squeeze his paint directly from the tube to the canvas. And followed up in the 1900s, Jackson Pollock used impasto in his abstract art using thick drips, smears and quick swipes with his brush. Some of his paint drips were so thick and heavy, that Museums and collectors are having problems preserving his work. Preserving Impasto can be a challenge and preserving it quickly can be even more of a challenge. However, with Weber Permalba Fast Drying Impasto Gel, artists can now use thicker amounts of oil paints and make their own impasto paintings without waiting for weeks for the oil paint to dry. 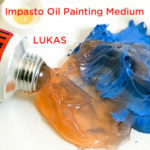 By mixing in the fast drying impasto gel with the oil paint on the palette, painters will now only have to wait 2-4 hours for their paint to dry instead of days to weeks waiting for it to dry. It really is an indispensable addition to any painter’s supply, with great results. It also can make opaque colors more transparent and can add a shine to your work. 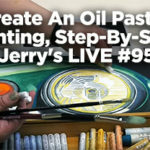 Permalba Fast Drying Impasto Gel is only available through Jerry’s Artarama, a real Jerry’s Exclusive. And for varnishing your painting and saving colors from yellowing, don’t forget about the Gamblin Gamvar and Gamsol Power Pack which has the fastest drying semi gloss to preserve your paintings. 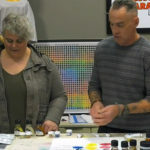 Jerry’s Artarama has the right tools you need to preserve your Impasto Paintings so that you can continue to create masterpieces just like these Impasto masters!